Fingerling potatoes are cooked until tender and served with a delicious fresh aioli for dipping. It’s a great, hearty appetizer to serve for any special dinner or party! You won’t believe how magnificent these are until you taste them. I saw Ina making these on Barefoot Contessa the other day and I was INSTANTLY sold. Basically you cut fingerling potatoes in half and lay them all out on a platter with a big bowl of freshly made aioli, and you dip the fingerling potatoes into the aioli and eat. If you’ve never made aioli at home, now is the time. It’s SO easy and sooooooo tangy, creamy and delicious. 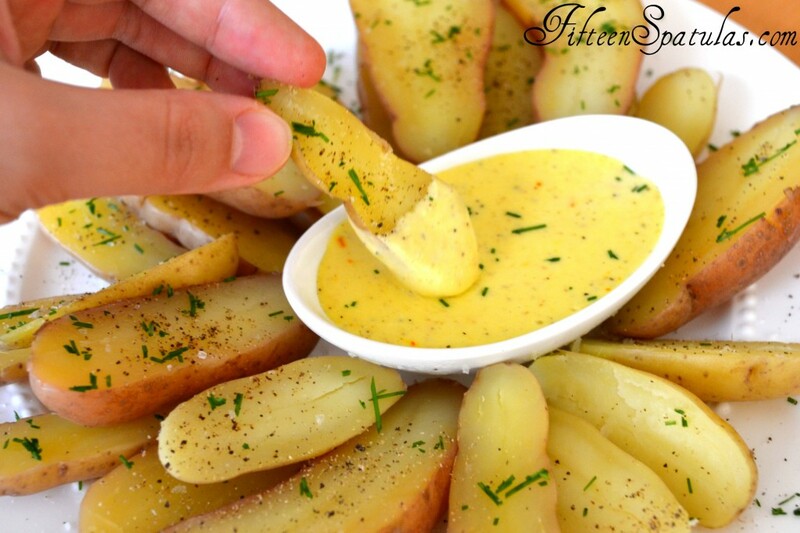 Fingerling potatoes are cooked until tender and served with a delicious fresh aioli for dipping. It's a great, hearty appetizer to serve for any special dinner or party! Place the half bread slice in a bowl with the cider vinegar. Let it soak and soften up for 5 minutes. We will use this bread to thicken the aioli. 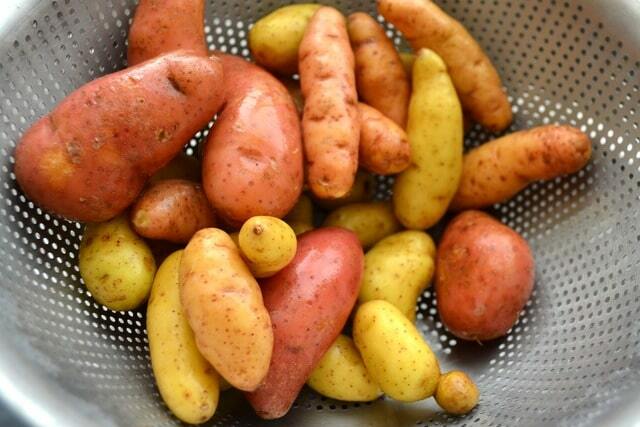 Place the fingerling potatoes in a big pot and cover with cold water. Toss in a tablespoon of salt, then bring to a boil, and simmer for about 10-15 minutes, depending on the size of your fingerlings. They are done when they are fork tender (taste one to be sure they are perfectly done). Drain and let cool. In the meantime, it’s time to make the aioli. 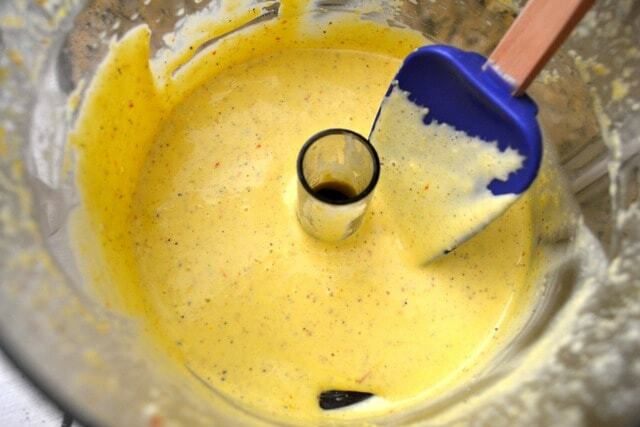 Place the garlic, egg yolks, lemon zest, lemon juice, saffron, 1/2 teaspoon salt and black pepper in a food processor and blend until very smooth (you don’t want big chunks of raw garlic in the aioli). Toss in the bread and its vinegar, and process again until smooth and distributed. With the food processor running, stream in the olive oil so it can emulsify. Once it’s a smooth homogeneous mixture, taste and adjust seasoning, if necessary. Slice the fingerlings in half down the length of the potato. Lay them on a platter with a bowl of aioli, and season the potatoes with sea salt and pepper, and sprinkle with chives. Serve and enjoy! 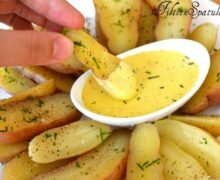 If I do not find fingerings to buy, can I use small potatoes and slice them in tiny wedges? Can I use sweet potatoes too? Hi Doris, I’m having a tricky time finding fingerlings lately too! If you can’t find fingerlings, you can try to get those small heirloom type potatoes. If you can’t find those either then you could try to cut the potatoes into wedges. You know what I think would be extra good? I make these garlic herb steak fries (recipe here: https://www.fifteenspatulas.com/garlic-herb-steak-fries/ ) and make this dipping aioli for those. It’s scrumptious! This sounds delicous, just one question: because of the raw egg, is it pasteurized? I know that there’s probably nothing to worry about, but I always just feel safer knowing that I won’t get that 1% chance or whatever of getting samonella. 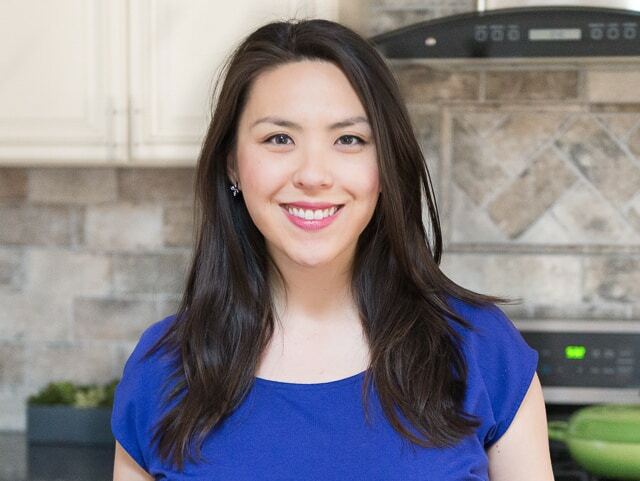 Do you think that you could pasteurize the yolks in a double boiler beforehand, like with a semifreddo, then let them cool and add them to the ailoli? Hi Myrtle, I would recommend just starting with some pasteurized eggs, you can buy them at the store now which is pretty cool!